Pop-up stores aren't new in the automotive world and in this case it's a chance for Open Road Group to "reach out to clientele we usually do business with." 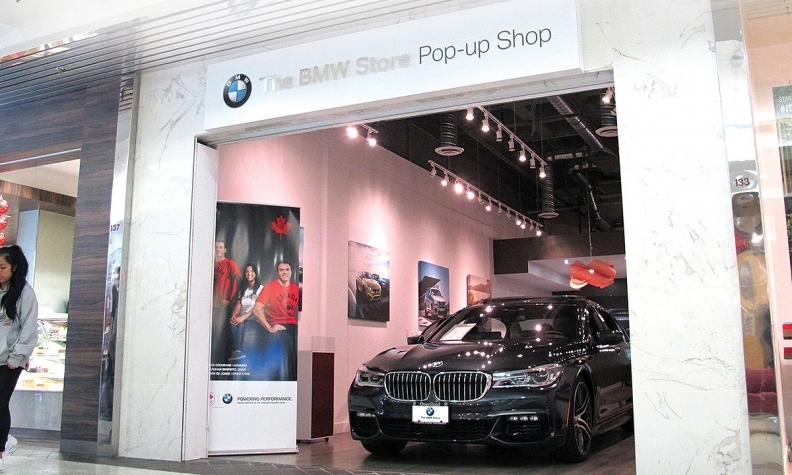 You only have to roll through the parking garage at Vancouver’s Oakridge Shopping Centre to understand why Open Road Group’s BMW Store decided to locate a pop-up shop in the upscale mall. There seem to be an inordinate number of newer German luxury cars seeded among the bread-and-butter vehicles, especially Mercedes and BMW models. The mall, located on the city’s affluent West Side, is popular with new Canadians who have emigrated from China and settled in the surrounding neighbourhoods. “So we thought this is very conducive to our market at this mall and here’s another way to reach out to the clientele we usually deal with,” said Aly Jiwani, general manager of The BMW Store, whose main location is in a cluster of luxury dealerships just outside the downtown core. Pop-up stores aren’t new to automobile retailing, even to BMW, which has used them to showcase its BMW ‘i’ sub-brand internationally and in 2014 put one in a Costa Mesa, Calif., mall to drive traffic to area dealerships. The Oakridge pop-up, which opened in mid-July, appears to be the first for the brand in Canada. It was Open Road’s brainchild though BMW Canada was aware of it, Jiwani said. It’s not exactly easy to find, however. It occupies a narrow storefront off the main shopping thoroughfare, sandwiched between a busy Chinese bakery and a LensCrafters store. A big $150,000 BMW 740iL sedan and a $50,000 X1 wagon take up most of the space. Jessica Yet, a member of the store’s “street team,” said people come in to check out the cars, take a brochure and maybe buy some of the BMW-branded merchandise on display. That’s all customers can buy because the pop-up is not licensed for auto-sales transactions. Sales staff at the location provide referrals to the dealership and arrange for test drives. “It’s to generate the lead and do the transaction at the dealership itself,” Jiwani said. The pop-up has created traffic at the dealership, he said, but at time of writing had only resulted in one sale. “Is the whole point to try and sell lots of cars out of it?” Jiwani said. The approach is more conducive to marketing luxury brands where monthly payments and practicality, important in the volume-sales market, are trumped by image and lifestyle factors, he said. It’s too early say whether this pop-up will morph into a permanent location, he said. The space will stay open for the rest of the year, with a decision in the new year whether to remain.